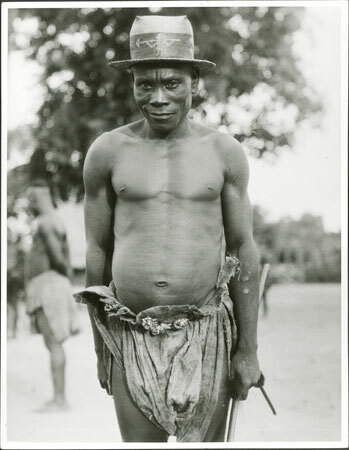 A three-quarter length portrait of a standing man (identified as Bage, a deputy of Prince Gangura in the settlement in which Evans-Pritchard resided during fieldwork) wearing a straw hat and barkcloth. Morton, Chris. "Zande chief's deputy" Southern Sudan Project (in development). 03 Jan. 2006. Pitt Rivers Museum. <http://southernsudan.prm.ox.ac.uk/details/2005.111.21/>.